Stagestore.ca is located in London, Ontario Canada. How late can I place my order to have it shipped today? Typically orders placed before 2pm EST will ship that day when the product is in stock. We can accommodate some late rush orders up to 4pm EST however we recommend you contact Stagestore.ca at 1-866-356-4138 if you have a rush order. Additional charges may apply. Shipping from London, Ontario most orders in Ontario and Southern Quebec take one day to arrive. Which courier will my order ship with? 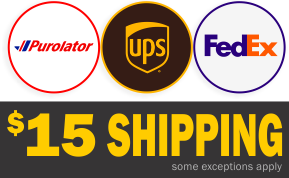 Stagestore.ca ships with UPS, Purolator Courier and Canada Post depending delivery address and associated cost. If you require shipment with a specific courier, please note your requirement in the order notes. Additional charges may apply. Stagestore.ca utilizes Paypal’s secure payment system to process your payment. You can pay with your Paypal account as well as VISA, MasterCard and American Express. If you are looking to make a purchase for your school, government agency or other institution you may contact info@stagestore.ca or 1-866-356-4138 to discuss alternative payment options. Stagestore.ca does not extend credit to just anyone. Our online payment processing system is easy and convenient, so we recommend most people use this system. Can I pickup my order at Stagestore.ca? Yes, you can! We are located at 1069 Clarke Rd in London. Please contact use before you come to ensure your order is ready to be picked up. Although Stagestore.ca is happy to receive returns of defective equipment or products we are unable to accept returns of consumable products. Returns of gel filters, tape, gobos and paint will not be accepted without exceptional circumstances. If you feel you have a good reason for returning the product, please contact us at info@stagestore.ca or 1-866-356-4138 and we’ll be happy to discuss your situation. Most orders from Stagestore.ca ship from our London, Ontario location however due to the size of some orders or your deliver address occasionally orders ship directly from the manufacturer’s Canadian location. For example; if you order a large quantity of Rosco paint your order may ship from Rosco’s location in Markham, Ontario. Sorry, Stagestore.ca only ships to Canadian addresses. No Stagestore.ca does not ship to PO Boxes. What do I do if I have a “unique” delivery address? Canada is a big place with many unique delivery requirements. If you have anything “out of the ordinary” about your delivery address, please let us know and we will work to accommodate your needs. Unfortunately, we are not able to accommodate every request, but we’ll certainly try. I need a bunch of stuff, is there any price break for quantity? As a rule, the pricing on Stagestore.ca is what we sell the product for however if you are looking to order large quantities please contact us at info@stagestore.ca or 1-866-356-4138 and we can discuss if bulk discounts are an option. I plan on reselling this product, are their dealer discounts? If you are looking to order large quantities or place regular recurring standard orders, please contact us at info@stagestore.ca or 1-866-356-4138 and we can discuss if bulk discounts are an option. Why is my shipping cost higher than the flat rate charge? Most Stagestore.ca orders to most locations in Canada ship with the flat rate charge. However, some orders are quite heavy or require special handling (like paint for instance). And some locations in Canada are, simply put, WAY more expensive to ship to. We work hard to find cost effective ways to get our products to Canadians but unfortunately not every order or location meets the flat rate service guidelines. I’m building a new theatre and could use some help with the design and purchase of equipment. Can Stagestore.ca help me with that?